I observed the people using the left bank of elevators in the Tisch School of the Arts to determine what interactions take place and how they happen. Like most elevators, they have buttons which illuminate when pressed to show which floors have been selected. Unfortunately, there are two main problems with these buttons. The first is that pressing the buttons is fairly unreliable, and the second is that the buttons' illumination is extremely faint. For the frequent elevator user accustomed to accurate button inputs and clear signaling, the Tisch elevators can be challenging. Pressing the button once, however firmly, does not guarantee anything, and you can forget about a casual glance at the button panel, unless you want to go somewhere other than where you want to go. 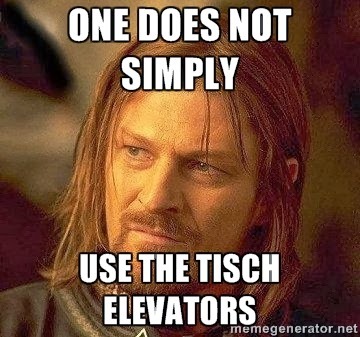 The experienced Tisch elevator user knows the ways of reducing the chances of accidentally skipping your desired floor. They know that repeatedly jamming the button improves your odds of the elevator system registering your button press. They also know that there is no possible way to tell what floors have been selected unless you get your eyes within an inch or two of the button panel. For those who don't want to stoop, repeatedly jamming the button regardless of if that button has already been pressed usually does the trick. The transaction time is a few seconds longer than it has to be, which is plenty annoying, but the real downside is that the current state of interaction creates a feeling of uncertainty for everyone in the elevator, and worse, causes problems for people with physical disabilities who often have to take the elevator.